When I first moved to Penland in 2011, my old kiln was not happy about trying to fire cone ten crystalline glazes. The mugs on the right show what you get when you use hypersensitive glazes that are not getting the firing cycle that they prefer. I don’t like to get too comfortable. Moving around the country every couple of years has been a way for me to stay fresh and enjoy a sense of new beginnings. The one constant was that my studio practice was at the center of my decisions about where to go. Paradoxically, the regular moves both served and hindered the development of my work. In one sense, the transfer of skills to a new studio and kilns was empowering; in another sense, it threw me into perpetually new learning curves. 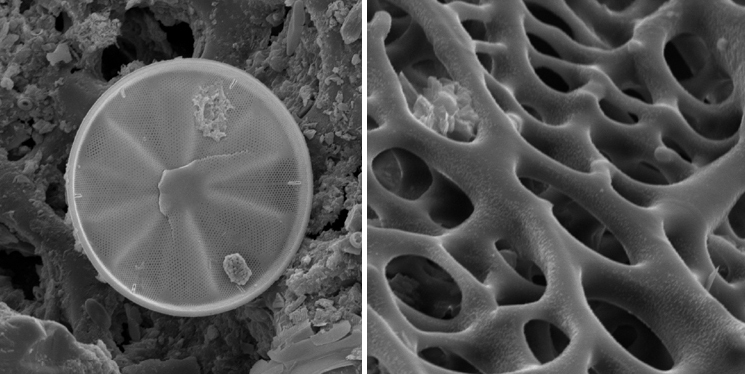 Studying diatoms (unicellular algae whose cell walls are made up of silica, like the one on the left) and the sand dollar on the right helped me define my aesthetic choices and also refine the conceptual implications of the forms I was choosing to make. This all began for me when I was an undergraduate, my mind opening to new ways of thinking and becoming aware of my own cognitive horizon and perceptual habits. My mantra, “The peril of the structure is the cage,” was a reminder to me that though I wanted to develop a strong inner core, I also wanted to cultivate a permeability that would allow for dynamic evolution. I later found the perfect visual and formal metaphor for this concept in studying the cell walls of diatoms and other beach rubble using a scanning electron microscope. Over time, as I studied educational theory, this restless disposition became the ground for my creative discomfort theory. This inspiring discomfort is not painful, it is playful. It is a way of staying open and flexible in one’s perceptions and behaviors. It’s more like the heightened awareness that you have when you are travelling – as you try to understand and inhabit a new cultural system, geography, and language. Your old ways of living in the world may not all apply. In studio practice, there is a delicate balance between gaining mastery and staying fresh. For someone dedicated to transformation, there may be cycles of learning to do something, then a period of improvisation and building out from that point to find new territory. At some point for the cycle to become a dynamic spiral of growth, there may have to be a breaking down of one’s learned responses in order to discover something new. It is up to us to decide when a habit of ours is enabling us to make the work we want to make, and when that habit has become a limitation. These images show the evolution of my mugs since I began exploring a form that I initially was calling a vertigo design. Some of the transformations are internal to the mug, or to the process of making. Others you can see happening, like watching the development of a hollow handle that harmonized with the form. I recently renamed my creative discomfort theory to account for the fact that learning is nonlinear and doesn’t result in a static state of balance. I now think about transformation as a process of dynamic disequilibrium. Dynamic disequilibrium means that as organisms living within the ecosystem of our lives, we live in a state of flux, continuously making small adjustments as we fall in and out of balance. Temporary states of vertigo, after all, can liberate us to find new paths. As makers, we are always imagining new visions and ideals that guide our studio practice, and our practice in turn is always revising those visions and ideals as they unfold into material. Usually this means that the closer we come to manifesting our visions, the more those visions morph into a new set of ideals with their own revised demands. We are all different in how we handle the processes of equilibration, how steadily or rigidly we hold onto our sense of equilibrium and how open we are to being nudged out of our comfort zone. It also changes over the course of our lives - sometimes we may be more open to change than others. It can help us get through a big project and achieve a goal when we are more rigid in our structure, after all. As I turn my attention to teaching undergraduates at Kutztown University this year, I am grateful for the chance to help them enter the journey of a life with clay at its center. Central to my work as an educator will be finding where each student is in her process, and intuitively sensing when to offer support and encouragement and when to nudge or challenge. At times I may have to help some of them get comfortable, even. Originally published on the Objective Clay website, 08.2016.